The car that smashed into a police van is seen at Avenue des Champs-Élysées on June 19, 2017, in Paris, France. Police swarmed the Champs-Élysées in Paris, after a vehicle rammed into a police truck and burst into flames in the popular tourist spot. Authorities say they believe the crash was an intentional attack, and the car driven by the assailant may have been packed with explosives. But besides the driver — who police say is now dead — no cops or bystanders suffered any injuries. Witnesses reporting seeing the alleged driver on the ground after the crash, which matches initial reports that said the motorist was “downed.” Police say the suspect was armed, and had been knocked out and gravely injured in an encounter with police. Later, officials said the suspect had died from the the severity of his wounds. The assailant has not been identified; Reuters reports that he was known to authorities. At least part of the Champs-Élysées has been evacuated with the police operation underway. A bomb squad is casing the area. 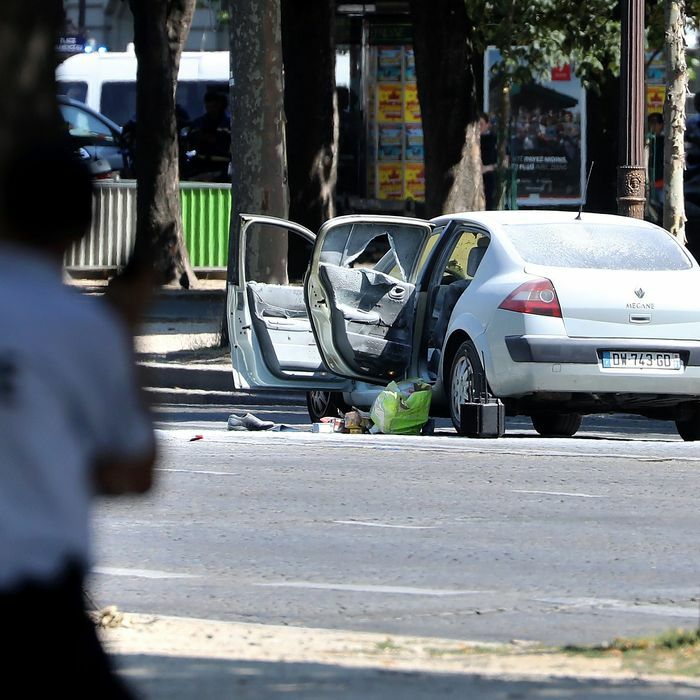 France’s anti-terrorism prosecutor has officially opened a case, reports the Associated Press. France, and Paris in particular, has witnesses multiple extremist-inspired terror incidents over the past year. Monday’s incident could potentially be the second such attack since President Emmanuel Macron won the presidency. In April, days before the election, ISIS took credit after a man opened fire at police on the Champs-Élysées, killing one police officer. In June, an ISIS-inspired terrorist lunged at a police officer near Notre Dame, in Paris, with a hammer, before he was shot and injured by police. ISIS propaganda has encouraged its followers to wage attacks in the west during Ramadan; this marks the last week of the Muslim holy month. And if a deliberate attack, it would come less than 24 hours after a terror incident in London, in which a 48-year-old white man rammed a van into a crowd of Muslim worshippers leaving a mosque in what early evidence suggests was an extremist right-wing attack. It is the third such deadly assault with a vehicle in London since March, and the fourth major terror incident in the United Kingdom.